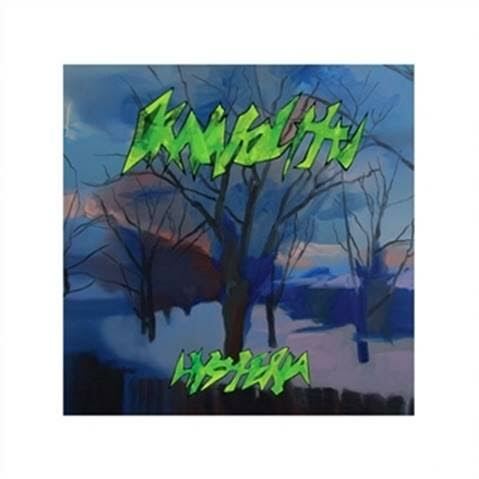 The dark, droning, quirky massacre that is Drainolith’s “Hysteria” has obtained a certain aesthetic that can only possibly be described as Montreal underground. The combination of Alexander Moskos’ wild array of unique talents has produced a genre-smashing ensemble sound culminating in an album that is simply marvelous across the board and especially perfect for the CKUT scene. The secret is in the presentation. The album is not very groundbreaking or progressive on-paper, however, every sound involved is so specifically imagined and manipulated that it provides the listener with a certain commitment to itself. Nothing is ever second-guessed. Moskos approaches each instrument with an uninterrupted intensity and purpose. The synthesizer settings, guitar pedal selections, and drum machine filters fit together perfectly. The trance-like, looping electronic drones are expertly complimented by Moskos’ obscure sense of guitar and vocal melody and all the while the album remains somewhat minimalist and never approaches the overbearing. Sometimes artists find it hard to explain their work because the easiest way for them to express themselves is through their art, however, this does not seem to be the case for Drainolith as he has provided an extensive breakdown of each song in the album’s liner notes. The first song is “clearly about the legendary Dane Kane… a hangaround for the Sorel Chapter of the Hell’s Angels.” The note goes on to explain Kane’s involvement in the biker wars against the Rock Machine while maintaining his status as an informant for the RCMP. Moskos seems to be a big fan of Kane and his tone throughout the liner notes eludes to his awe of the subject matter of his pieces. It is clear that he has thoroughly thought through his pieces and they have been brought to life with a clear headed songwriting approach. What is most important in the execution of this album is the evolution it displays from Drainolith. Drainolith’s first album “Where Are Ye Col. Leslie Groves,” is a display of Alexander Moskos’ production talent and its obscurity approaches sound art. The world witnessed a spike in Drainolith’s songwriting in 2012 with the release of “Fighting!” More vocals and concrete song composition resulted in a very good, youthful sounding album, but Drainolith’s voice had not quite been found yet. The tonality of “Hysteria” is the perfect balanced blend of Alexander Moskos’ talents and he has reached a very confident, mature point in his career as a solo artist. Again, Drainolith has really created something fantastic here. Hysteria is as hard hitting as a metal band with the electronic characteristics of industrial music and the attitude of a punk rock and it truly is another album perfectly curtailed to CKUT programming.